There's just too much to choose from! For my 31st birthday this year, Katie was kind enough NOT to book a 31-course dinner - last year's 7-hour feast was amazing, but I'd definitely be dead by 35 if we kept that up! Instead, she spread it out over a few days. Birthday celebrations began as all should - with breakfast custom mint ice cream cakes! Last in the day (at a more acceptable hour), we had dinner at the Cellar restaurant, where you can literally order anything on the menu as many times as you'd like ("Can I have 3 steaks, please?"). What do you have for dessert at a restaurant that will bring you whatever you want? Why, cupcakes you import from Sugar Daddy's location down the street, of course. The next day, we had a nice, low-key dinner on the 25th with just the two of us at Traiteur. The food was, as always, fantastic, but the real winner at that place is the unbelievable bread. Fortunately, they kept it coming, and 3 baskets of mini-baguettes later, I was ready for bed! Our beloved Fiona will be moving out of her apartment soon (and into a new one), and in order to say goodbye to the humble abode she decided to throw one last fete - an 80's party! With only 48 hours to prepare I began scouring the town for a few items that would speak to the cherished decade of my birth and subsequent formative years. Thankfully it seems that no one has actually told Forever 21, H&M, New Look and Top Shop what year it actually is, so my shopping excursion was much easier than I anticipated! I was thrilled with my finds and when I spoke to Matt on the phone I told him that he had a great costume to come home to. "How do you feel about Ducky" I said. "Who's Ducky?" he said. (He's never seen Pretty in Pink - don't get me started. Or the Land Before Time, clearly). As we got ready for the party we rocked out with some MJ, Crowded House, Tears for Fears, and Hughie Lewis, just to get in the mood. When we arrived - me in an all lace 'ode to Madonna' ensemble and Matt in his nerd chic outfit, we came through the door only to hear our friend Sarah exclaim "oh my gosh you look just like Ducky!". Mission accomplished. The only thing from our own closets is our shoes! Fiona was rocking the ugly bridesmaid look. You're just minding your own business - vouge-ing away, and Axl Rose and Slash accost you! Lisa and Bas provided all the day-glo colors and the necessary tights and leg warmers. Best accessory of the night. No question. Note: the Iron Maiden t-shirt is from the actual tour - an artifact! Would our "characters" have been friends in high school? Lisa is feeling the power of the 80's woman! Don't embrace it too much Lis - next stop huge shoulder pads and a paige boy haircut! Over the years, Dubai has been hit-or-miss with strange concerts: "Rock the Desert" heavy metal concert out in the dunes, Aerosmith tearing up Formula 1, Enrique Iglesias playing for what turned out to be 50 people at a idiotically executed property launch, and an absolutely horrible high school orchestra at a jewelry show (hint - the orchestra is not where you skimp on your budget!). They seem to be getting better, though. 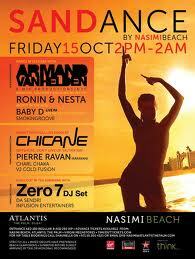 Nasimi beach at the Atlantis set aside a kilometer of beach on the outer ring of the palm, set up an enormous stage, and welcome tens of thousands to the Sandance Music Festival. Armand Van Helden and Chicane were the headliners, but the rest of the ad above is fall advertising - there was no swimming allowed whatsoever! Of course, Atlantis doesn't understand how to throw an event without fireworks. From their $20 million launch party in 2008 until now, hardly a Friday goes by without fireworks coming from the hotel. Guess you have to justify $500 a night any way you ca, now that the whale shark is gone! Dino told us upon arrival that his two short-listed options for his few days off was to visit us or Petra. I'm going to be honest. We cannot compete. Thus commencing a round of wild insecurity and our attempt to show him the best time possible in the coming two days. We did enjoy afresco drinks and dining at a few of the city' hots pots and Dino made great time seeing the city's requsite tourist sites. When I suggested that the Big Bus Tour would be an excellent way to see all the sites, he stared me right in the eye and said, "There is no way I am doing that." Clearly, we had under estimated him! (He saw the sites in record time). He also accompanied us to our monthly American Business Council luncheon where our guest speaker was the head of the Export/Import Bank. I'm sure Dino could have contributed a lot to the pre-lunch conversation as an Fellow for the International Reporting Project at The Paul H. Nitze School of Advanced International Studies at John Hopkins (I took that straight from the business card). I, however, just told people that he used to work in Mexico City (as the Bureau Chief of the Economist, no less - which I left out, I mean...why brag?) So he regaled our ambassador with stories of how exactly how not to get kidnapped in Mexico City. Well played Dino, well played. Dino also expanded his group of friends, and I'm told actually commissioned one of the stylist national dress costumes in the background. Stay tuned for this look at the next Kakaes's family New Year's Eve Party! Thanks for coming to see us Dino! 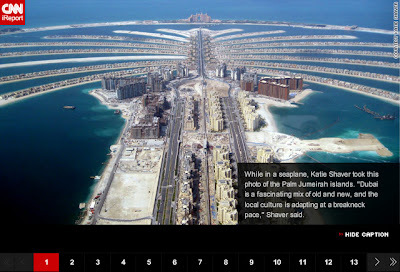 Our Photos Made the Cut - CNN iReport on Dubai! While Matt and I almost always take our photographs for an "audience" (here's looking at you Mom), we were thrilled to find out that today that our audience might be a big bigger than what we are used to! 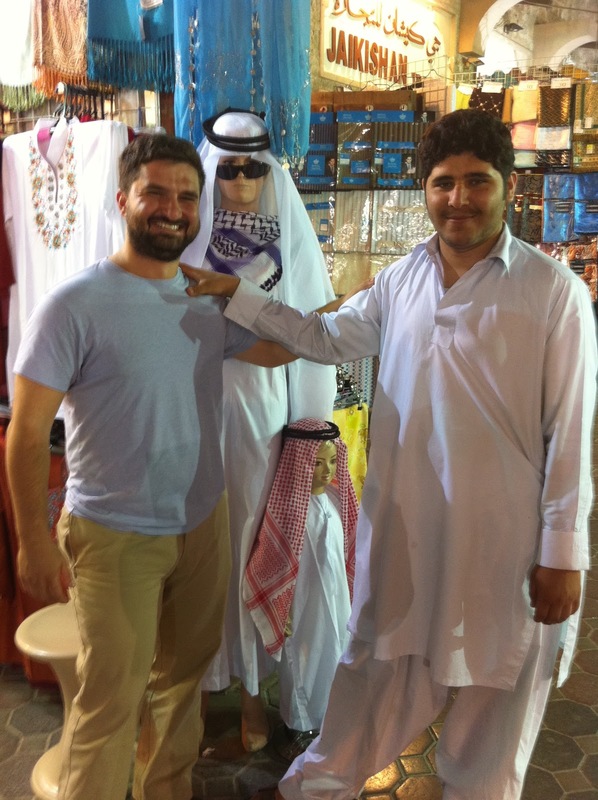 After conversing with a CNN reporter via email, they decided to chose 6 of the 10 photos we submitted for their photo story "Old and New Collide in Dubai". With only 14 photos being featured we are pretty pleased to make up almost 50% of the images! Of course, while I lay claim to having been present while all the pictures were taken and I helped defog the lens a few times, and possibly held a spare lens cap in my purse - Matt took all the pictures. I guess when you are married you have to learn how to share everything, including photo credits (crediting Matt appropriately got lost in translation via the email submission). Of course with the guts (to steal your husband's photos) comes the glory of having a few quotes posted on CNN's page for a few hours. Here's to Matt and his incredible 'eye' for Dubai. You may have noticed that we've added ads to our blog. Don't worry - you're not personally financing our addiction to rare, ferret-poop-covered coffee beans. 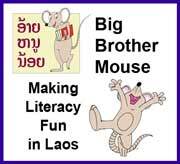 We've decided to start running ads to generate revenue that we can donate to the charities we have listed on the right-hand side, like Big Brother Mouse, Kiva.org, and others. Of course, we'd be nothing without you guys - which means we need your feedback on what charities to add into the mix. Have a special passion for water purification in India? Hand-crank-powered flashlights in Haiti? Race for the Cure for Hiccups? Let us know, and we'll check it out and throw it into the mix! In the Navy, You Can Sail the Seven Seas, In the Navy, You Can Visit Dubai! We got an extra special (and surprise) treat last night when Matt and I were able to meet up with my 2nd cousin Jim while he was in Dubai! Even more exciting was that Jim had just sailed into town with the US Navy after 98 days at sea on the USS Peleliu (she's pretty cool, learn more about her here: http://en.wikipedia.org/wiki/USS_Peleliu_%28LHA-5%29). Cheers to a "Global Force for Good"! When I asked Jim what he might be up for around town he admitted that a great pizza and a cold beer would probably do the trick. Good thing we knew just the place! We treated him and a friend to dinner at the top pizza place in Dubai, Bussola, and finished up with a drink at the quintessential Barasti Bar. It was a great chance to kick back, and enjoy some behind-the-scenes details about life on an amphibious assault ship with 1,000 people on it. Let's just say Real Housewives of NYC doesn't have anything on what kind of drama and intrigue goes on after 3 1/2 months without seeing land. I'm going to buy the rights to this TV show now but only if Jim promises to act as the host! Thanks for dropping in guys! And thanks for all you do to keep us safe and sound (and privy to some awesome stories). Oh and they also recommended that we check out this little gem. We haven't been the same since! Instincts are very powerful tools - they teach you to dodge, duck, dive, and wake up when someone pours water on you. They also teach you to avoid foods that have killed some of your less lucky ancestors - bad smell, rotten flavor, and general visual disgusting-ness are all good signs that you should move on. This looks like it would rank below Monday Mystery Meat at the school cafeteria, but the Garlic Saffron Curry Chicken made here was just about heaven. And even though the kitchen looked like this, we survived! This was too tasty to photograph - by the time I got a shot off, all Katie left behind was flourescent green sludge. I think it was an omelet of some sort. Also not what it seems - this bowl of nastyness in a hut on the riverbank is Saffron and Coconut Rice Crispy Treats. I kid you not. No rice pudding should ever be able to do this with a knife - unless, of course, it's 80% sugar, 15% coconut milk, and 5% rice. DELICIOUS. ...and the Mekong's favorite virility drink, a cobra snake and scorpion soaked in whiskey. I would like to apologize for any Brits that were offended in the reading of this post. The fact is, nobody is better at taking delicious ingredients like steak, butter, garlic, and potatoes and creating grey tasteless mushy peas out of thin air. Our hats go off to you! An if you really believed the monkey brains thing, I'm very sorry. The truth is, the monkey brains weren't from humane MENSA farms, they were just regular monkeys (sorry again). Oh Boy, The Traffic Is Back! 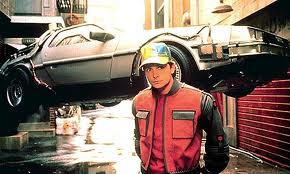 Remember that line at the end of Back to the Future where Doc Brown says "Roads? 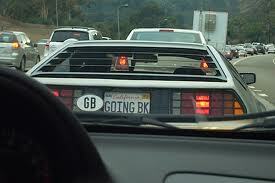 Where we're going, we don't need roads." Sadly, he was referring to a 2015 utopia that will never materialize (I'm keeping my fingers crossed for those fly clothes, though). Instead, where we live today, you can't even use the roads. 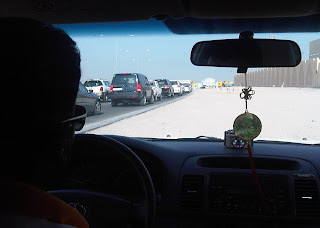 See below - that's after I paid my taxi driver a little sumthin'-sumthin' to make his own lane in that little thing we call the "desert". Time is money! If traffic and restaurant reservations are any indication, Dubai is back. I don't think that holds true for jobs and bonuses, but fingers are crossed for that all over the city. Of course, if you do get a nice shiny new job, you'll have find a way to actually get there. Last weekend as he was driving home from some errands Matt calls and says "I'd like to go out for lunch, somewhere in the neighborhood, what do you think?" I agree that lunch plans sound great and wonder what Matt has in mind. In Arlington this surely would mean a delicious Italian Store Napoli sub or a Faccia Luna pizza (missing these!) however in Dubai our 'neighborhood' is a little less traditional. Little did I know that Matt's ambitious plans were to visit our friendly 'tallest building in the world' and eat lunch at the newly launched Armani hotel. Firstly, we haven't been to the Burj Khalifa yet, very few people have. In fact I think we are all a little afraid of it and the Armani hotel, to boot. I think we all assume that entering the building must be more complicated that just driving up to the front doors (it wasn't). I mean shouldn't you have to jump through some extra hoops to get into the world's tallest building? Then there was the Armani hotel factor. Do you have to wear Armani to get in? Do you need a reservation? Is there some secret code you need to tell the doorman? (psssstt....the eagle has landed...). Turns out that it's a normal hotel who is suffering under the guise of people thinking that they can't get into the Burj or the hotel. It's cool to be exclusive, but not so exclusive no one thinks they can get in! Finally a view of our building from the Burj Khalifa instead of the other way around! We need to get to the top of the Burj now, so we can finally look down on the Address hotel. The Armani hotel is on the lower level of the Burj. The entire interior is done up in creams, tans, and soft golds. As my friend Fiona stated "I feel like I am in a serene cave". Hope that's what you were going for Mr. Armani? We enjoyed a fantastic meal at the Italian restaurant Ristorante (that's redundant isn't it?) and then were treated to a tour of the entire hotel thanks to the affable and highly trained staff. If fact, rumor has it that Ristorante is in the pennant race for Best Italian Restaurant in the Middle East with the Italian restaurant in the Intercontinental in Cairo. The entire staff is focused on out gunning them - you got to love competitively served food. Burrata with marinated veggies to start. The gnocchi was beautifully plated and delicious! Braised beef and black truffle ravioli. The closest thing we can get to mint chocolate chip! In fact we liked it so much that we returned a few days later to try out the sushi restaurant Hashi, which didn't disappoint and Matt enjoyed meeting their sake sommelier. Of course, if there is fire involved Matt is interested. Next time we will try the hibachi! So hats off to the Armani hotel! The Prive club at the hotel. PS. Please remember us when you are packed 3 months from now? We loved you when everybody else was scared to!